LEAN CUISINE: Whirlpool Sweden puts DFA to work to cut parts by 29 percent and assembly time by 26 percent. Training is a valuable investment, but companies don’t expect immediate profits from the training sessions themselves. 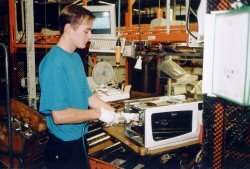 At Whirlpool Sweden in Norrköping, though, this was exactly the case as they trained cross-functional teams of in-plant personnel to perform design for assembly (DFA) analysis. Whirlpool Sweden in Norrköping is a Whirlpool Global Technology Center for microwave ovens. It manufactures over one million ovens a year. Whirlpool Sweden produces several platforms of microwave ovens, with varying options on some of the base models. The company’s primary market is Europe, though there are some overseas sales as well. The plant produces 5000 microwave ovens a day. Assembly is almost exclusively manual. Because the European market favors simple, low-cost appliances, oven designs must be as lean as possible, and assembly of the final product rapid and inexpensive. A DFA training program at Norrköping was initiated with two goals. The first was to teach two teams of eight people each how to perform DFA analysis using specialized software. The cross-functional teams included mechanical and electrical engineers, microwave technicians, designers for air ventilation systems, and personnel directly involved with production and assembly. The second goal was to reduce in-plant costs and generate a lean oven design by using a proposed production model as part of the DFA teaching process. Cost reduction was expected to come from reducing the number of parts in the oven assembly and from reducing overall assembly time as a result of integrating parts and simplifying or eliminating assembly processes. Whirlpool Europe’s tool of choice for DFA analysis is DFMA®, or Design for Manufacture and Assembly, cost and design analysis software from Boothroyd Dewhurst, Inc. (BDI), Wakefield, R.I. The software guides design teams through a systematic analysis that enables them to benchmark existing designs and propose new designs that consolidate parts and eliminate assembly difficulties. In so doing, the teams reduce assembly time, increase assembly efficiency and quality and produce lean, functionally integrated designs. Stefan Wohnhas, a DFA champion at Whirlpool, says, “It was important for us to develop a DFA implementation strategy with a target, a running project, in order to train people in using DFMA as a standard tool in the product development process.” His object was to focus the design teams on existing products and ongoing design projects so that participants would see measurable benefits from learning and applying the DFA methodology and the DFMA software. Fortunately, there was an ideal project in-house that presented both a new design and a benchmark. Whirlpool Sweden was planning the introduction of a new oven. Since the new oven will replace Whirlpool’s current microwave oven, the VIP 20, the decision was made to benchmark the VIP 20 and use DFA analysis to create the design for the new oven. The Whirlpool VIP 20 is a 900-watt microwave oven with the cavity-ceiling quartz grill option. Controls are mechanical (pushbuttons and dials), which are preferred in the European market over touchpads and digital displays. They include seven presets, a twenty-four-hour clock, and a ninety-minute timer. The quartz grill allows for the grilling of meat in the oven. 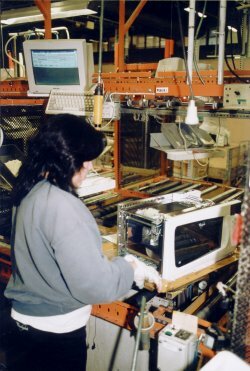 In 1997 the VIP 20 represented nearly one-third of Whirlpool Sweden’s total oven production. The overall assembly of the VIP 20 shares characteristics common to most microwave ovens. The outer chassis is bent and clinched sheet metal. The sheet metal cooking cavity, fitted snugly to the chassis, reflects the microwaves during cooking. A hinged door, either side-opening or drop-down, includes a perforated steel wall that reflects microwaves but allows users to view the food or beverage being cooked. The cooking cavity includes a lamp for observation. Most of the oven components are mounted in the area behind the control panel, in the pocket between the cooking cavity sidewall and the chassis sidewall. The microwave source is a magnetron, which in turn receives power from a transformer. Screws and other fasteners hold components in place. Cabling connects the components, nearly all of which are electrical, and fasteners guide the cabling and hold it in place. Redesign of a microwave oven presents a number of design and assembly challenges. To save kitchen counter space, the footprint of a microwave oven is as small as possible, but a small footprint reduces the available component space. Inside the oven, the spatial relationship of some components must be maintained. Because the magnetron can reach 200°C during operation, air from a fan must flow across the magnetron and the transformer that powers it. Finally, the fastening and wiring of each component can require inserting tools and hands into this small component space. As more components are installed during assembly, there is less room for tools and hands to maneuver. DFMA software was not the only tool available to the DFA teams. To benchmark the present assembly, they reviewed videotape of the VIP 20 assembly line, noting any awkward operations and assembly reorientation. To review proposed design revisions, they used a 3D product modeling program, Pro/ENGINEER. They employed stereo lithography for physical prototype examination. They also created laser-cut steel sheets, which were then folded to the exact shape and size of components. This allowed the designers to physically assess component arrangement and fit. For each assembly workstation, the DFA teams prepared a performance matrix that evaluated each assembly operation for ease or awkwardness. Is the assembler taking advantage of gravity or fighting it? Is assembly conducted in the open, or in a constricted area? Does an operation require reorienting the assembly? How much assembler time is spent holding components and fastening them in place? From the evaluations came simple changes to save assembly time. In the original design, for example, the torsion spring for the drop-down door was fastened to the bottom of the door, underneath the chassis. In order to fasten the spring in place, the worker had to turn the chassis over, fasten the spring, then turn the chassis back over for the next operation. This slowed the assembly line. Moving the spring fastening point so that it was accessible from the front of the oven eliminated the need to reorient the chassis. The rest of the door assembly was a target for parts reduction. Dahm says, “Formerly, fixing the door hinge to the oven chassis required fasteners. Now we use the line where the cavity and chassis fit together as a fastener that automatically holds the hinge in place.” The new design also reduced the tolerance build-up between the fasteners, the chassis, the cavity and the hinge. In the long run this will reduce wear and improve product quality. The design teams also identified unnecessary fasteners for the cabling, and reduced the number of parts still further by standardizing the cabling itself. Lastly, they set a goal for future product models of having as few unique components as possible, thereby reducing in-plant inventory and MRP costs. The proposed design for the new oven was leaner than that of the VIP 20 despite adding a forced convection feature. Whereas the VIP 20 had 150 parts in its original design, the new oven has only 106, a 29 percent part reduction. That alone would reduce assembly time, but because many of the eliminated parts were fasteners, assembly operations were further reduced. 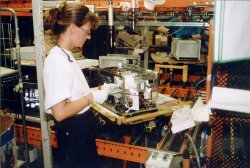 In addition to the lean design, the open-assembly strategy and the elimination of reorientations will lower assembly time an estimated 26 per cent when the product line comes out in late 1999. The Norrköping plant won’t have to wait to see cost benefits. It has already implemented the standardization of cables on present product lines. A secondary benefit of the DFA sessions was the standardization of chassis on the different product lines. 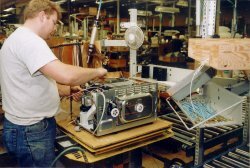 Improved assembly methods and parts reduction have thus far produced savings greatly exceeding expectations. At that rate, payback time for the entire training project was six months.